Last week, I wrote about Jane Wood who has brought quality architecture to Littlehampton in the form of Thomas Heatherwick’s East Beach Café, Asif Khan’s West Beach Café, Studio Weave’s World’s Longest Bench and Flanagan Lawrence’s Stage by the Sea. Her latest project is Riverside Wharf. I’ve enjoyed Littlehampton for years and have always felt a little let down by the rows of Barratt-type developments that line the River Arun, the town’s centre-piece. They are by no means offensive, and no doubt make delightful homes, but simply don’t inspire. Riverside Wharf raises the bar somewhat. 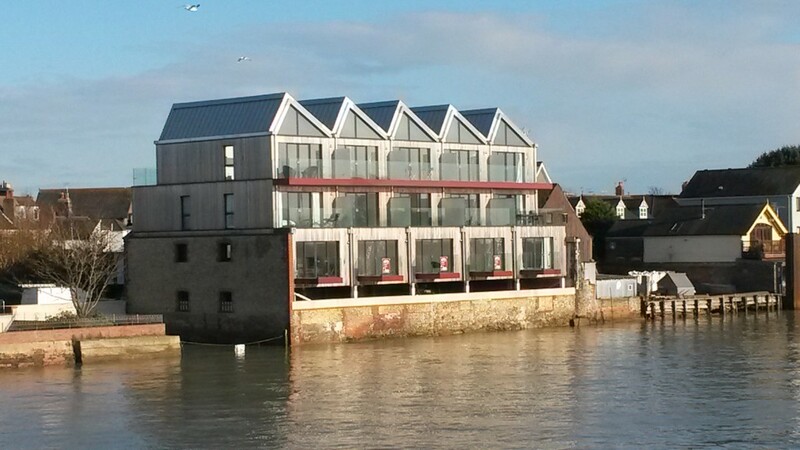 This modern development replaces a small stretch of Victorian industrial buildings by the town’s footbridge. More accurately, it part-replaces, as some of the best bits of the old buildings’ flint and brick facades have been incorporated into the new glass, zinc and cedar structure. 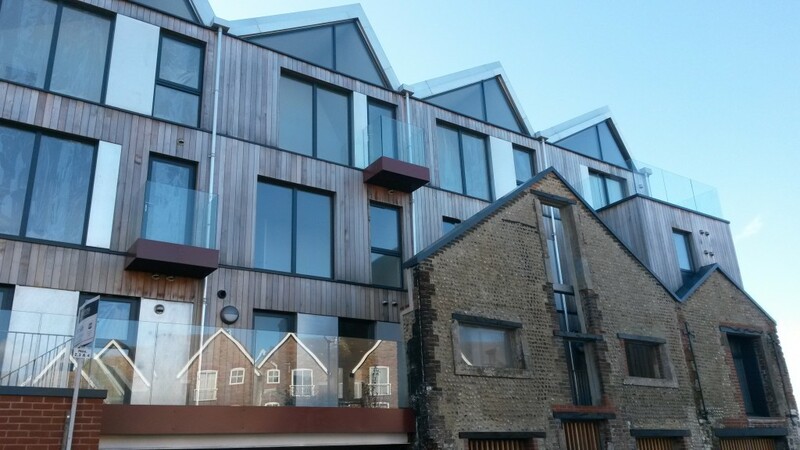 The scheme consists of five three-storey houses (costing £650-700k) that float above a ground floor shared car park. They were completed this year to the designs of Hampshire-based architect John Pardey who, more locally, has designed a number of key elements at the University of Sussex and also houses on Withdean Road. Within Riverside Wharf, there is considerable blurring between interior and exterior spaces. Glass expanses give views across the ever-changing river and balconies jut out in all sorts of different places. The cavities beneath the building’s sawtooth roof have been incorporated into upstairs bedrooms rather than turned into lofts. It would be unfair to say that Brighton & Hove has nothing to offer when it comes to good modern architecture but there are sadly few examples. ‘One Hove Park’ by Yelo Architects and Hyde Housing is at least looking promising. Littlehampton is a fraction of the size though and now has five structures to shout about – all by Jane Wood.